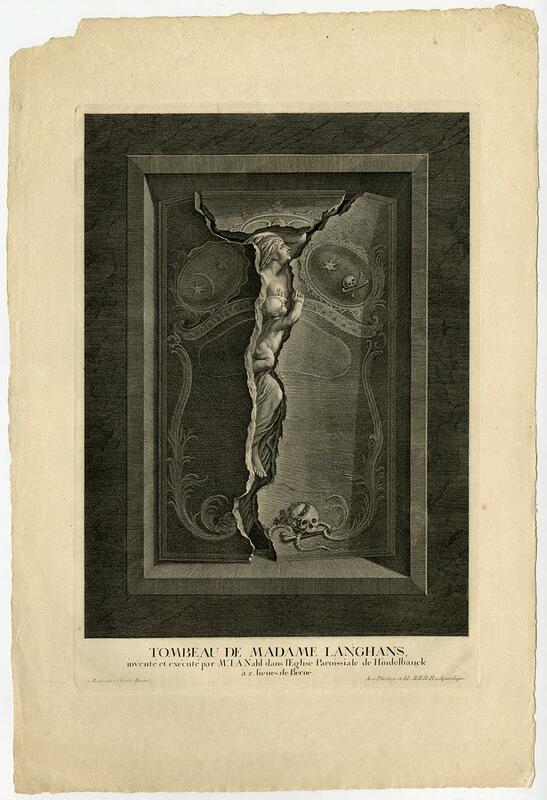 - Antique Master Print, titled: 'Tombeau de madame Langhans.' - The tombstone of Madame Langhans. Depiction of the famous grave of madame Langhans, who was considered as one of the most beautiful women of Switzerland. She died at the age of 28 in childbirth, while the sculptor Nahl was visiting her and her husband. Due to this tragic event Nahl created this magnificent tombstone. Engraving on hand laid paper. Description: Source unknown, to be determined.Artists and Engravers: Made by 'Christian von Mechel' after 'Johann August Nahl'. Christian von Mechel (1737-1817) was a Swiss engraver and editor from Basle / Basel. He worked in Paris, Nuremberg and Vienna. Johan August Nahl (German; 1710-1781) was a sculptor form Kassel. He worked for Frederick the Great. Condition: Very good, given age. Large margins. Paper loss in the top left margin corner (not nearly affecting image). Very faint soiling in the margins. General age-related toning and/or occasional minor defects from handling. Please study scan carefully. Storage location: TPCLA-P6-10 LATPC The overall size is ca. 13.8 x 20.5 inch. The image size is ca. 10.7 x 15.5 inch. The overall size is ca. 35 x 52 cm. The image size is ca. 27.2 x 39.4 cm.